Waiting lists are something that have been on our todo list for ages - finally they're here! The idea is to allow people to sign up to your event after it's sold out - if more spaces then become available (you refund somebody or move them to another event, for example), waiting-listers get first refusal on the spaces. This process is should be completely automated. 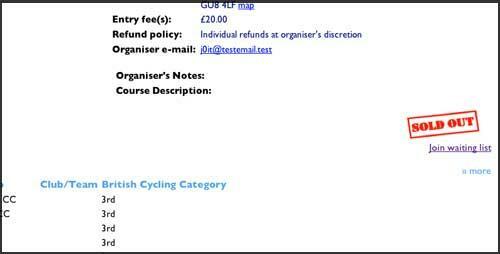 You can also add entrants to the waiting list manually, in the same way that you add 'manual entries' to your event: suppose your event is full but someone sends you a postal entry, you can add them to the event waiting list queue and when/if they reach the front they will automatically be added to the entry list with no further involvement from you. First you specify how big your waiting list should be, by clicking 'edit entrylist' and putting a number other than zero in the 'waiting list' box. 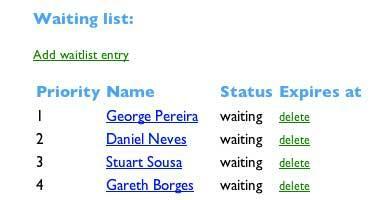 (You can add 'manual' waiting list members using the 'add waiting list entry' link). Suppose you now refund someone, or move them to a different event - so your field now has one space in it. Because of the waiting list setup the event will still show as 'sold out', but the first waiting list entry will switch to 'pending' status and an email will be sent to them offering them the chance to pay their entry fee and join the entrants. If they haven't successfully entered with 24 hours, RiderHQ will delete their waiting list space and move on to the next waiting list entrant. You can also delete a space manually if you know the entrant doesn't intend to take it up. Should more than one space appear, RiderHQ will invite as many waiting list members as there are spaces. If you increase the maximum number of entrants, RiderHQ will keep the event in 'Sold out' mode unless the maximum entries exceeds the number of entrants on the waiting list + the current number of entries, so waiting list members will always get a chance to convert their place into an entry. If you decrease the max entries, 'pending' waiting-listers will still have their invite honoured, but no further waiting-listers will be invited. In summary, managing your waiting list should be as simple as selecting the number of spaces allowed on the waiting list and letting RiderHQ keep your event full.